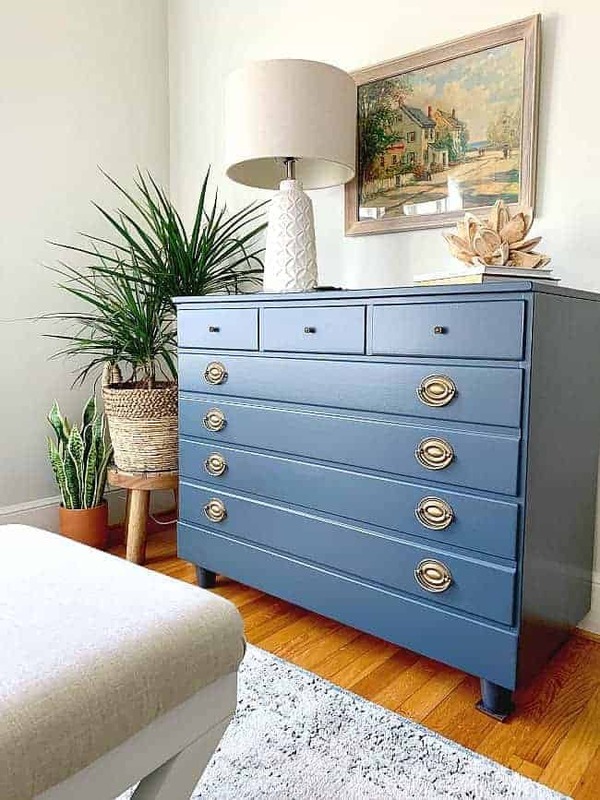 An easy and inexpensive nightstand makeover for a thrifted piece of furniture. 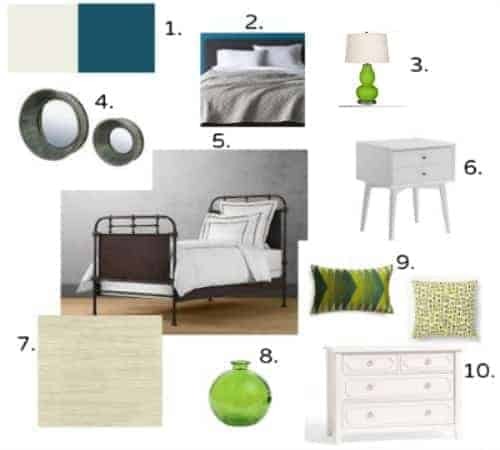 In January I shared the mood board for the guest room makeover, which included a new nightstand from West Elm. After starting the redo and assessing my needs and wants for the room, I decided to stick with what I had and to try to give the old nightstand a new look. I bought this piece years ago at a thrift store. It was really inexpensive but the problem was that you could tell. Although it’s made of wood there was a big gap on both sides that I wanted to try to disguise with trim. Instead of trim though, I came up with another idea. I decided to try to use paint sticks to give it a different look and to cover up the gaps. Because I love the look of planked walls, I thought I would try that idea but on a much smaller scale (and on a piece of furniture). I figured that I had nothing to lose by trying and dove right in. First, I laid a few of the paint sticks on the nightstand so I could see where the seams would lay. Once I had an idea of what I wanted, I used the razor knife to cut the notched handle off, so that I had straight pieces. Next, the rough edges were lightly sanded smooth. Since one stick wasn’t long enough to fill a whole row, I ended up using a small piece of another stick. I also staggered the seams to keep the rustic feel. 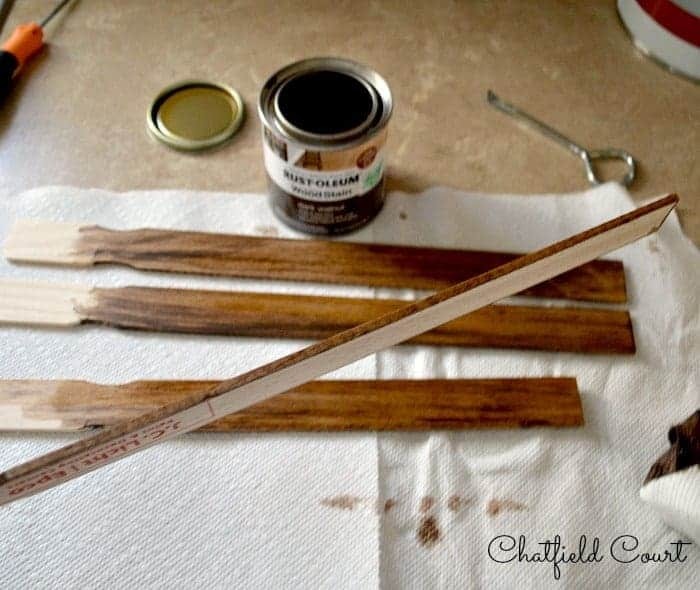 Next, I used a paper towel and dark walnut wood stain on each paint stick. The paint sticks I got were all made from different wood, so that really added to the rustic look. I wasn’t sure if I would like it but I really loved the differences in the wood tones. After they were dry, which didn’t take long, I glued each piece to the side of the nightstand. To ensure that my sticks stuck, I ended up using a heavy weight and some canned beans to weigh them down until they dried. Once I finished one side of the nightstand, I flipped it over and glued down the other side. That’s it. This project really was so easy but it did take me take me some time to complete because I had to let the glue dry before I could remove the weights and move on to the next row. You can really see the difference in the wood tones in this pic. To add to the rustic look, I also replaced the glass knobs with oil-rubbed bronze knobs that I already had. So what do you think? 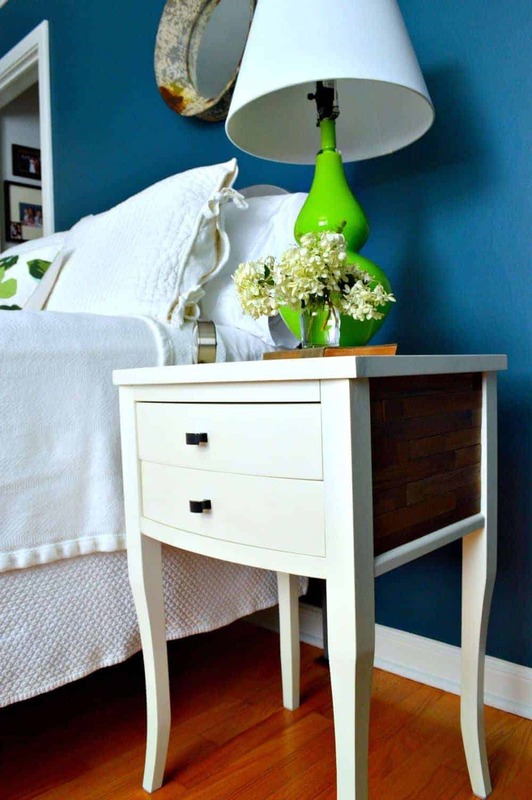 Is this nightstand makeover something you would try? I like that it was practically free to do. I already had the glue and the stain on hand and the paint sticks were free. There’s nothing better than free! Now I have a “new” rustic-looking nightstand. Check out a few of my other upcycle projects I’ve done on furniture. What a clever idea using the paint sticks! Love how it turned out! This is absolutely brilliant! Visiting via Moonlight and Mason Jars. What a smart way to solve this problem. I am also in the process of redoing my dresser and this is such a nice look. Thanks for the inspiration. Pinning! 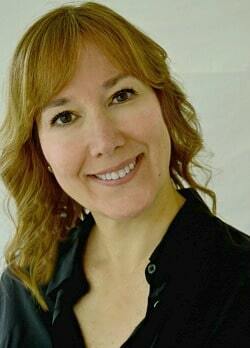 Kristi, I host a new link party Sweet Inspiration that runs Friday till Tuesday. I would love to have you join us. Thanks, Mary, I appreciate it. This one of my favorite projects to do. I’ll definitely stop over to your party. Thanks for the invite. This is beautiful! Thank you for linking up with Dream. Create. Inspire. Link! You’ll be one of our features this week! How exciting! Thanks so much, Cat! 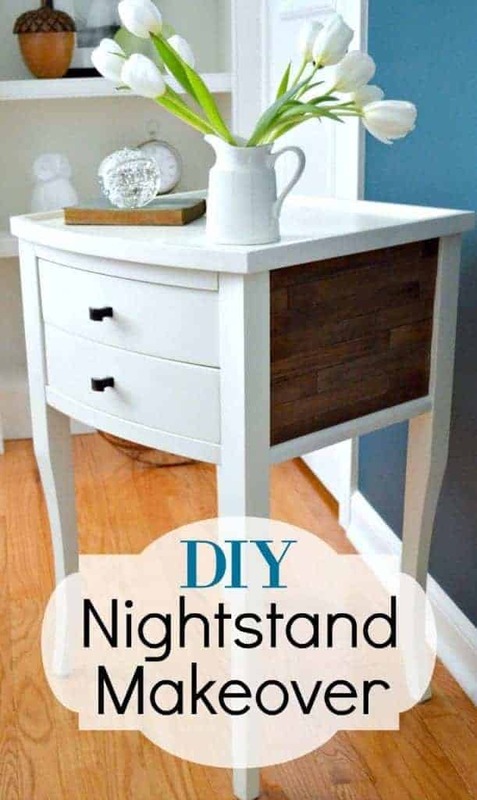 I love the contrast of the white nightstand against the dark stain. It looks amazing, and I never would have thought those were paint sticks! Beautiful mind you have to think of this idea! It looks soooo good! I would so love it if you would come share some of this inspiration at Making Broken Beautiful over at The Curator’s Collection! The party runs every Thursday thru Sunday and has just started. You do amazing work and I do hope you will come inspire! I hope you have an amazing day! 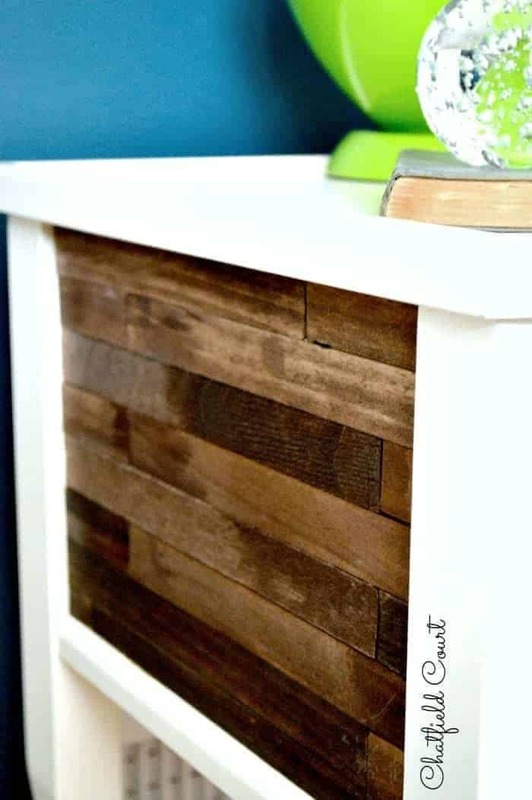 I love the look of the planked sides and was surprised to learn you used paint sticks. Pinned! Thank you for sharing at Merry Monday! Very Cute, Love how it turned out! Thanks, Amanda! I’m thrilled with the way it turned out. I am seriously in love with this rehab! We bought a furniture set when we got our first apartment a while ago, but the nightstand was always lacking in my opinion. This would be perfect to spruce it up a bit! 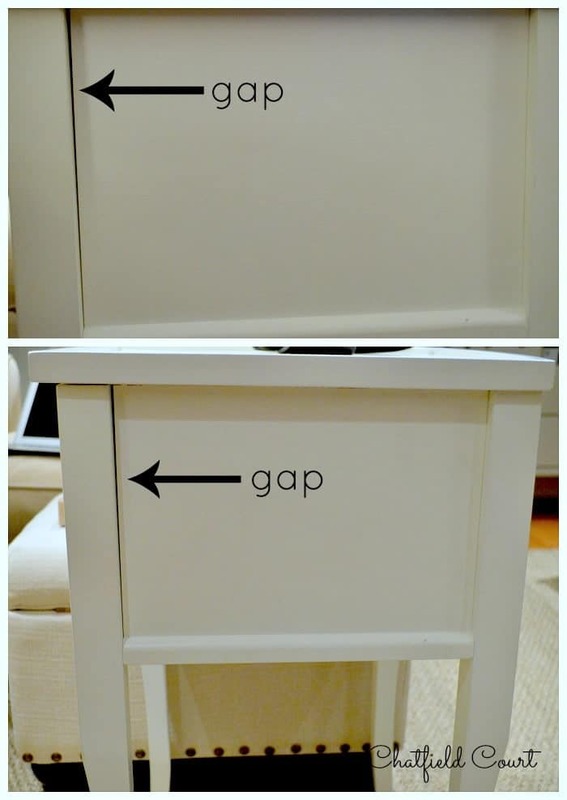 What a SUPER creative and inexpensive way to transform a piece of furniture! GENIUS!! Pinning and sharing! Thank you so much for sharing at The Wonderful Wednesday Blog Hop! Love the idea of using the paint sticks! Now to slowly to start stocking up on them! The nightstand turned out just right. What a clever idea to use paint sticks. Plus it looks good with the stain wood and painted wood. It is a classic look. Brilliant idea! This looks sooooo good! 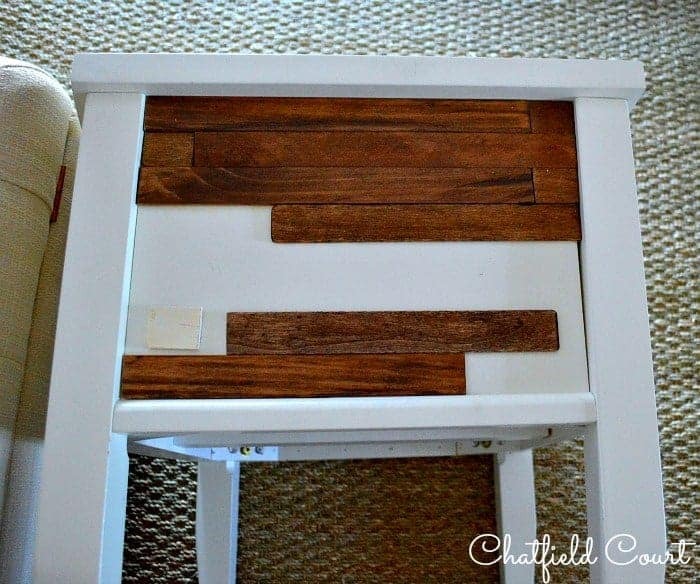 I love the way you took this little table to a whole other level! Well done! Love it, going to try it on an ikea shoe holder, its just boring white. What kind of glue did you use? Thanks Allie! I just used plain old Elmer’s wood glue. I did add a weight on each section as I glued them though, and I’ve not had any problems with it. Hope that helps. Good luck, hope your project turns out. I’d love to see it when you’re done. I thought about doing the top the same as the sides but held off for now. Still loving it like it is. That is REALLY NICE I love the look very smart. I will have to copy cat you on this one for sure. Thanks Debra. I would love to see what you do to copy this. Good luck! Thanks so much Michelle! Love your party…so fun. How clever! I love how this turned out. I would never have thought to use paint sticks. Thanks for sharing with Creative Spark Link Party. Thanks so much Glenna! I’m glad I found your Creative Spark Link Party…so fun. Thanks for hosting. What a nifty idea!! How creative!! Love the look of the wood and white. I am looking for ideas for my bedroom furniture. Even though they’re wood…after seeing this, I think the color I want to go with is White. I could somewhat have the same look!! I love the contrasting wood. I’ve been wanting to do something with paint sticks and now I really want to. Thanks Havalah! Hope you try it. I would love to see what you do. Hi Kristi! 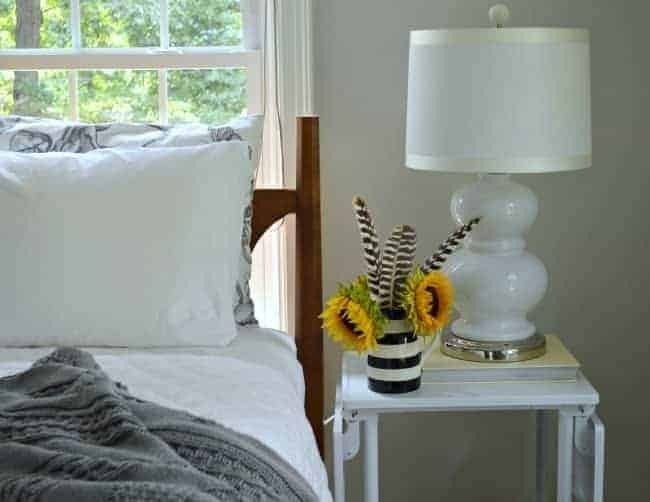 I just wanted to let you know that I LOVE your Paint Stick Nightstand, and I’m featuring you as one of my Rockstars this week from Creativity Unleashed! AWESOME! I am totally stealing your idea because imitation is the highest form of flattery! Thanks! Steal away Meagan. LOL I would love to see what you come up with! Stopping by from That DIY Party….This looks great! 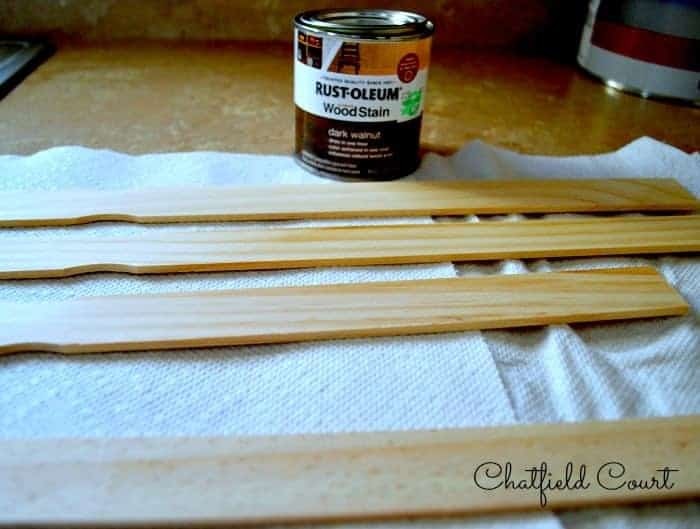 I love paint sticks but I never thought of using them like this! Great idea! Following you on social media – love if you’d follow back however you like! Thank you Shelly. I’m so glad you stopped by. Off to checkout your blog and follow. Wow, it looks completely different..in a great way! You did a fabulous job! My weekly Say G’Day Saturday linky party is on right now and this would be a wonderful addition. Please stop by and say g’day if you have a minute! Thank you Natasha! Heading over now to say g’day. Thanks for the invite. G’Day from Oz! I just wanted to pop back to let you know I am featuring you at my blog this week as one of my Friday Favorites. Wow…thanks so much for featuring me Natasha! I have to say I absolutely love look of your night stand and even better that you redid a piece you already had. Don’t know how much night stand at West Elm was but guessing enough to take family out to dinner? You did such an awesome job on that night stand, I’d sure buy if you were selling. The style and changes you made on it really give the stand interesting style and look. Pinning this so I don’t forget. What a nice comment Jane Ellen. Thanks so much. The West End nightstand was pretty expensive, more than I wanted to spend for a guest room, so I’m glad that my little project worked out and I didn’t have to spend any money. It sounds like you have some great ideas for your bedroom. I hope that you are able to try this project. I would love to hear about it and see pictures if you do! This looks amazing! I’m so impressed. Thanks so much Marie. I appreciate you coming over to visit and for commenting. I love the idea of using paint sticks. I really like to look it adds to the nightstand. I am in love with dark walnut stain and white, I am going to be using this combination on my kitchen table. Great work! Hi Megan. I love dark walnut stain and white too. Something about the contrast that makes it interesting. Thanks for stopping by and commenting. Good luck with your kitchen table. Thanks Mel. It really was an easy project to do. So glad you stopped by. Isn’t that just beautiful? What a great idea – thanks so much for sharing, I love it, it’s just so perfect against the paint ! I was already looking around at my furniture half way through your post, trying to find a victim for this creative look! Can you tell I love it? thanks for sharing. Thanks so much for visiting and for the sweet comment! I absolutely love this Re-Use Project. Your idea has inspired me to use this with pallet wood on Kitchen Cabinets that we got for free. When we made an island out of them there wasn’t a back and I have been trying to figure out something to do. THANK YOU!! So glad that my idea could inspire you Treshea. It sounds like your island is going to look great. I would love to see it after you’re finished. Thanks so much for reading and for your nice comment. I love the new look of these. I have two of the exact same tables in our bedroom……I will keep your idea in mind. Thank you for sharing. Thank you so much Lin. 🙂 Come back and share if you end up redoing your nightstands. Thanks so much Karin! I will be heading your way. You are so sweet, thanks Rayan! How creative! I would have never thought to do that. I like how the wood tones down the traditional look of the night stands just a bit. Great job! Thanks so much Sarah! I think that I like that it tones down the traditional look too. I wasn’t sure it would work, but I’m glad that it did. Thanks for stopping by. I really like it. Very clever idea using the paint sticks. I always grab an extra one when buying paint but I always end up losing them by the time we reach the truck. I think they slide out of the shopping cart and end up either on the store floor or parking lot. Nice that you could use something you already had instead of having to buy something new. That’s funny Shirlee. That happens to my husband too…they just disappear. ;) I always appreciate your visit. Thanks Emily. I’m loving the dresser that you redid. I like that you didn’t paint the top, that contrast makes it more interesting. I say steal the nightstand 😉 I would love to see what you do with it. Thanks so much for visiting. Wow, that is so beautiful and super creative to use paint sticks! Awww, thanks so much Carisa for the lovely compliment Carisa. This is so creative and beautiful. Would you consider using a stained pull now to carry the dark sides across the front of the piece? Thanks so much Jennie. That’s a great idea about the pull. 🙂 I’ll have to try it out. Wow, I love the transformation. Look how smart you are. You’re so sweet. Thanks so much.